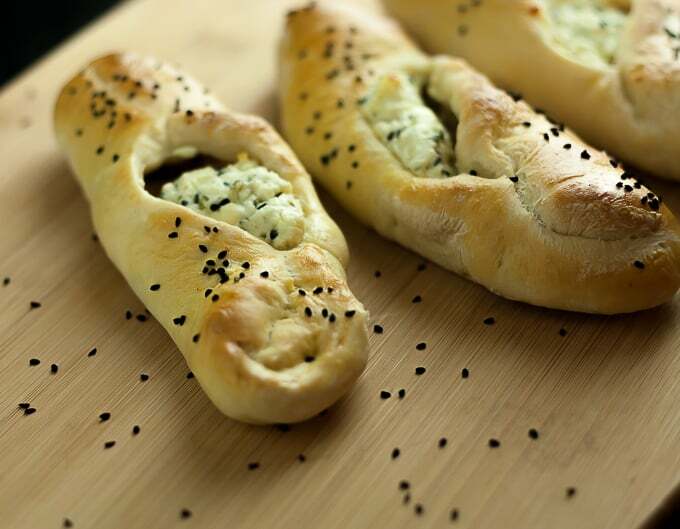 Lebanese cheese fatayers are savory pastries found throughout the Middle East. Fatayers can also be filled with meat (lamb is traditional.) Fatayers are found throughout the Arab world in pastry shops and market stalls. They can be triangular in shape or cigar-shaped (like the recipe below.) Lebanese cheese fatayers are similar to the Turkish pogacas or the Latin American empanada, or the Eastern European Burek. 1. Defrost the pizza dough. 2. Preheat your panggangan to 375’F. Line a baking sheet with parchment paper. 3. In a bowl combine the feta, yogurt, mozzarella, parsley and nutmeg. Crush with a spoon to break down the chunks of feta. You almost want the mixture to look like a very thick lumpy paste. 4. 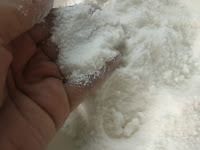 On a floured surface knead the dough until it is elastic. Roll into a log and cut into ten pieces. Roll each ball and set aside covered. 5. Roll out each ball into an oval shape and place about 2 tablespoons of filling down the center of the dough. 6. Fold over the top left of the dough over the filling and press down. Fold over the opposite side over the folded sided and pinch. Repeat the process at the bottom of the pastry. Brush with egg wash and place on parchment paper on cookie sheet. Sprinkle with nigella seeds. Repeat process until all fatayers have been made. 7. Bake at 350’F for 15-20 minutes or until golden brown.